Me and My brother at Busch gardens. 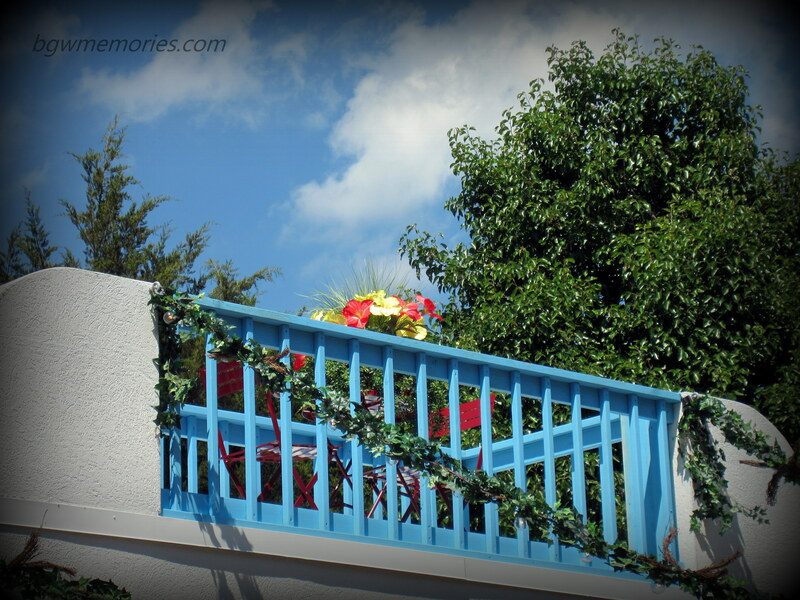 Deciding to create the BGW Memories Facebook Community and Blog was not an easy decision. I knew exactly how much effort and time would have to go into making this concept come to life. Despite worrying about late night editing, networking, frequents updates, messages, responses, and the occasional mean-spirited comments sent my way, I felt compelled to make it all happen. We all go through our lives hoping to make a connection with others. We seek out people who have similar likes and interests. We want to know that we are not alone. Often we look to our past in order to help us find these connections. What city we grew up in, what schools we attended, what ancestry we shared; are all bonds formed among a group of individuals. 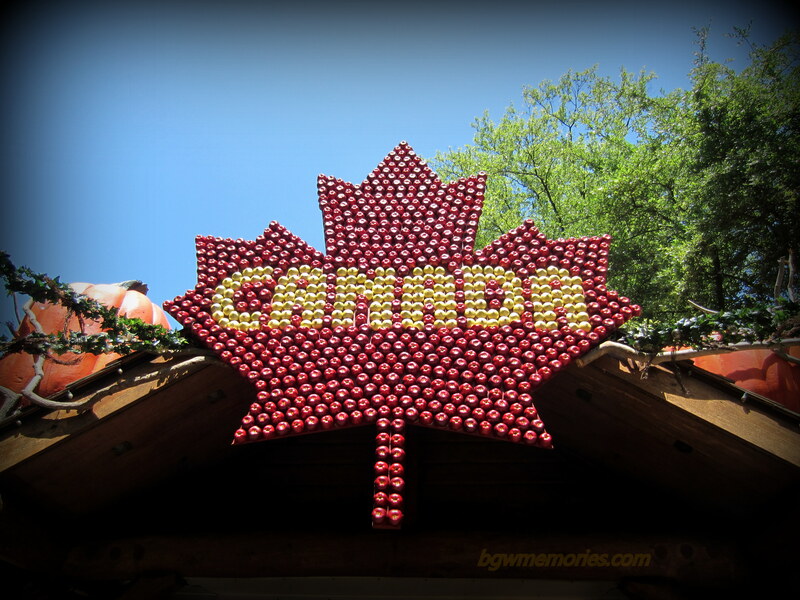 Since 1975, millions of people share the wonderful experience of visiting Busch Gardens Williamsburg. I am proud to be one of them. 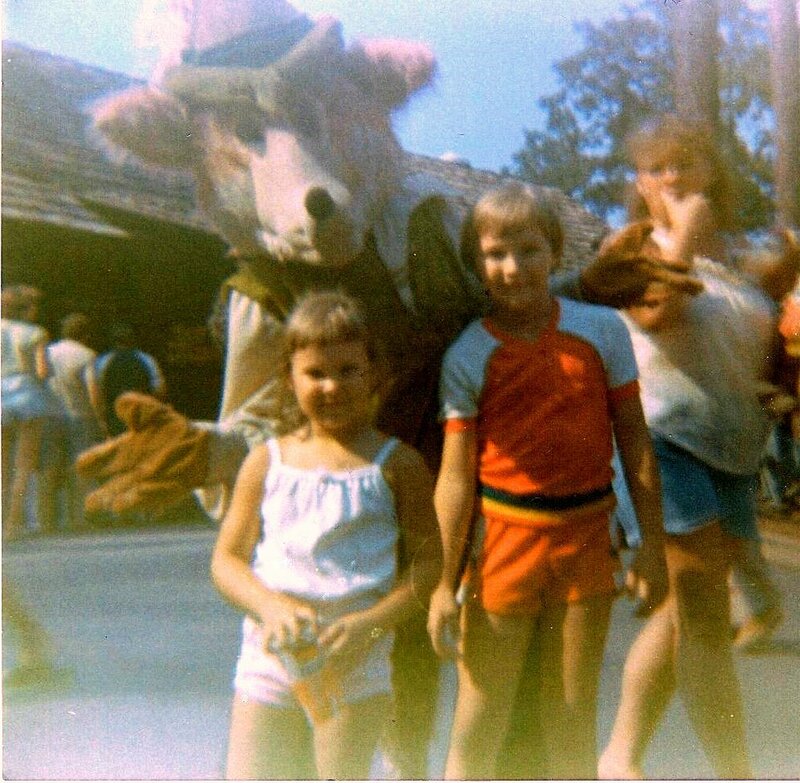 I have always lived near Busch Gardens Williamsburg. It was my constant, my babysitter, and my best friend. Many kids go to a summer camp. I went to Busch Gardens. In the 80’s my parents would drop my brother and I off at the park and we would roam freely around during the summer. It was heaven! Me flying the red Baron plane. For that reason, I decided to reach out to others like me and form a kinship by creating BGW Memories. It is my hope that by preserving the past, we will strengthen the bonds between generations of park goers. I am already thrilled that so many people have responded. What is even more amazing is that some kinships have already become friendships! There is one friend in particular I would like to mention. His name is Gary Terrell. 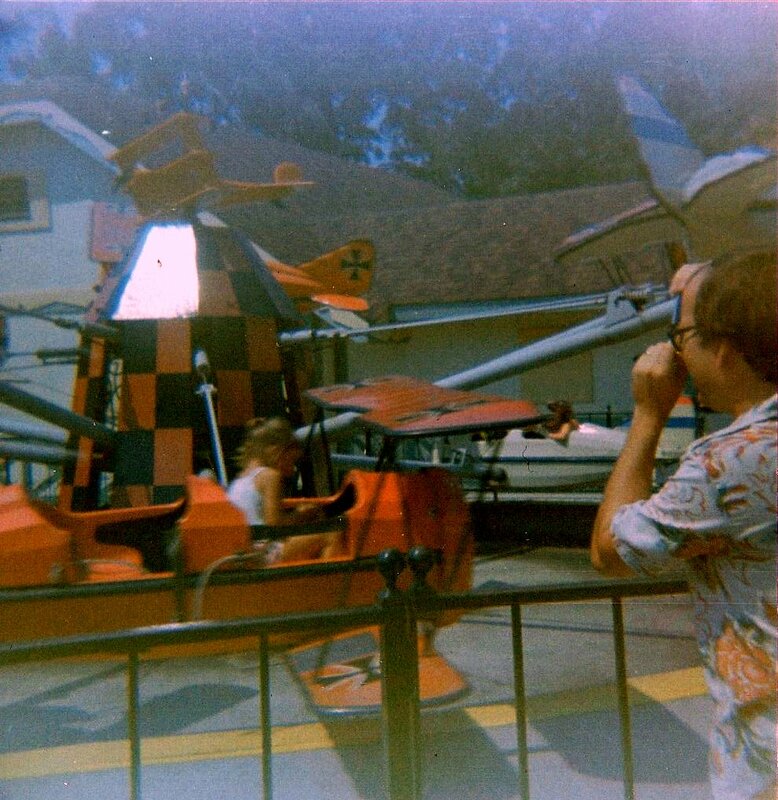 Since Gary first posted photos and stories here at BGW Memories, I was instantly drawn to how much we were alike. I thought to myself, “Here is a person that remembers those long forgotten details of the past and loves them as much as I do!” In fact, many of the photos shared here came from his collection. 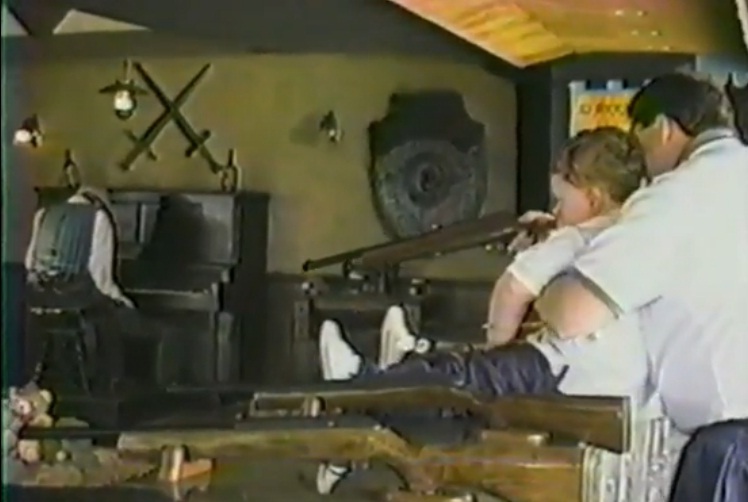 Gary helping his son at the Battlements Shooting Gallery. One item he sent to me recently was a video of his family visiting Busch Gardens in the 90s. When I watched the film, the happiness I heard in his voice and the smiles I saw on his wife and son’s faces brought such joy to my heart. It also brought me back to my own childhood. By sharing such a wonderful moment from his life, Gary helped me to remember my past as well; a truly priceless gift. 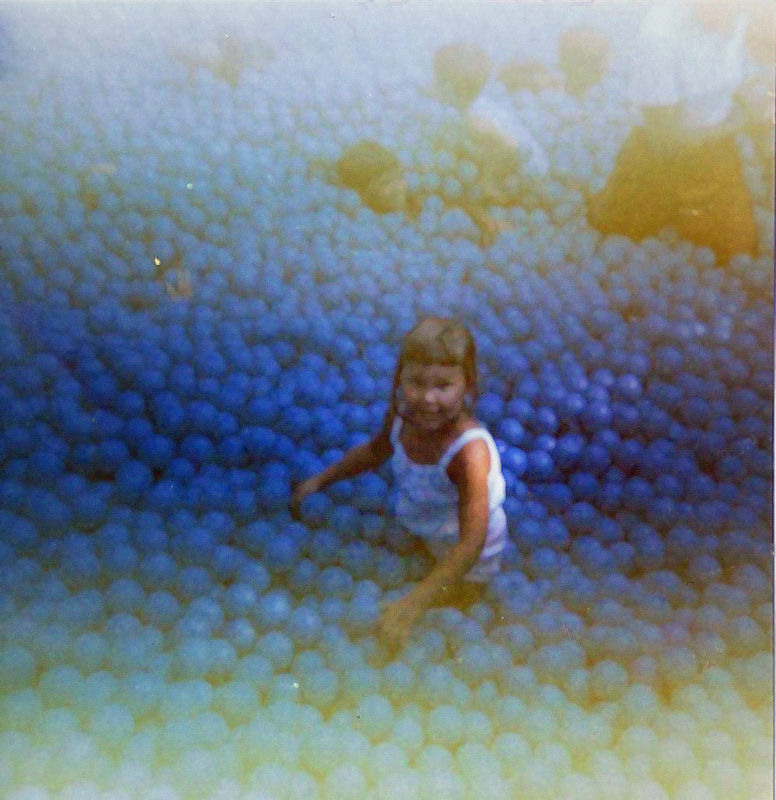 Me smiling up at my mom in the Ball Pit at Eagles Nest. So to all the people who wish to find a connection to their past at Busch Gardens Williamsburg, you are not alone. In fact, you may be holding that missing piece of history that someone out there has been searching for. The Michelin star rating for restaurants has only three awards with “Three Stars” being the highest an establishment can receive. Three stars is only rewarded to those rare places exceptional cuisine where diners eat extremely well, often superbly. Distinctive dishes are precisely executed, using superlative ingredients. “Une des meilleures tables, vaut le voyage” (Exceptional cuisine, worth a special journey). It’s official. My mind is blown. 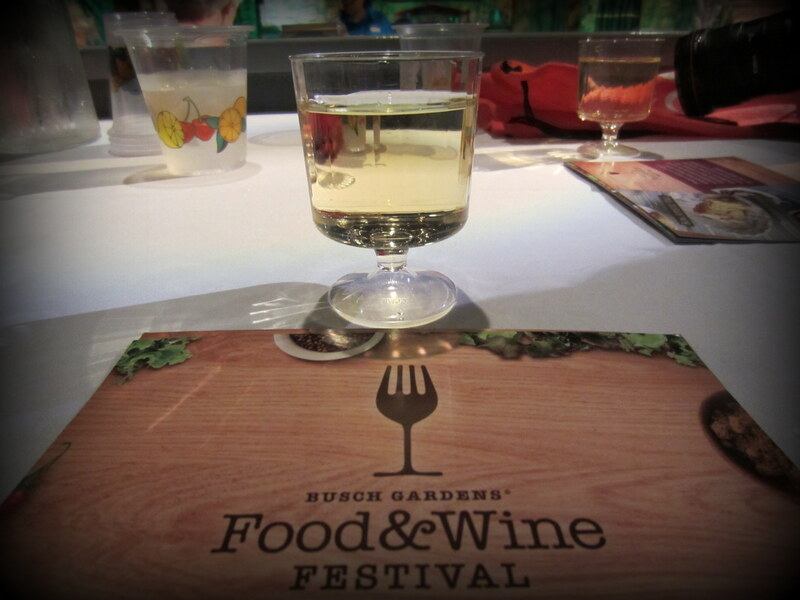 It’s been three days since I attended Busch Gardens Food & Wine Festival and I am still finding it hard to put into words just how amazing this event is. It’s like trying to describe the Mona Lisa or Niagara Falls to someone who hasn’t seen it. No matter what I say, I doubt I am capable of capturing the fun experience in writing. I was there for both the first “official” day of the event and the following day. Even with two full days of gluttony, I barely scratched the surface of what the Food & Wine Festival has to offer. For the first time in Busch Gardens history, I failed to ride any coasters. The only ride I did manage to hobble onto was the train and that was only to speed up the process of getting to and from food kiosks. The first day was spent learning how the Festival works and how to navigate through the lines to receive small tapas like portions of the various culinary delights. The choices! The flavors! How can one decide? It is as if Chef Gordon Ramsay made a smorgasbord of food and then told you to pick just one dish to eat. It cannot happen. “One simply cannot choose just one.” Thanks Boromir for providing us that lovely internet meme to use in this situation. Then, on top of that, each station has an array of beer and wine to select to go perfectly with your choice of delectable yumminess. There was one moment I envisioned myself looking like Jabba the Hut slithering around the park in a gorge fest of debauchery. I refrained.. barely. At the end of each day, I felt like the Mr. Creosote on Monty Python’s Meaning of Life that after eating, “one wafer thin” mint could cause my stomach to explode; and I was OK with that. I was happy. Very, very happy. I was also lucky. 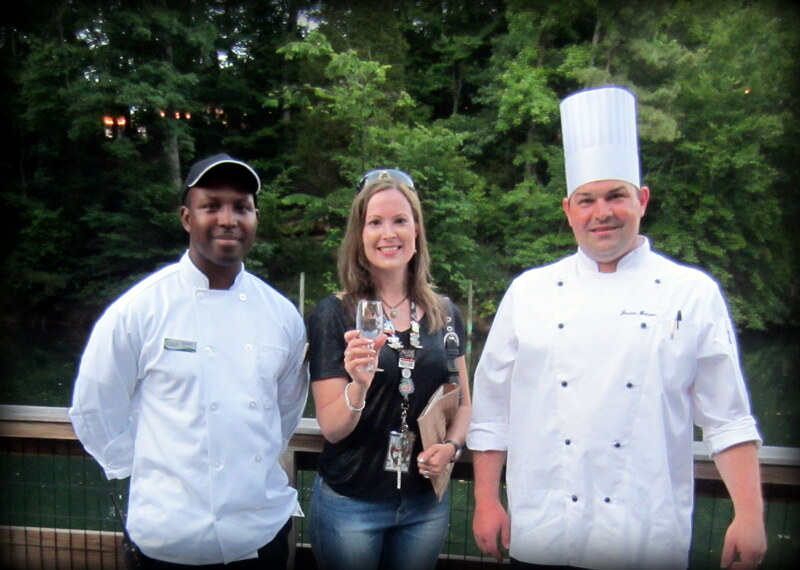 Bacchus must have been smiling upon me because I was picked for being the first contestant in the new show Grape Stompers, given a complimentary opportunity to enjoy the Chef’s Guest dinner, and also attend a special VIP event that included meeting the Resident Chef of Busch Gardens, Justin Watson, before setting sail on the Wine on the Rhine cruise. Thrilled, is not even close to describing how I felt about all this good fortune. However, my good fortune is yours as well! Now I have a very clear picture of the events, food, and wine to share with you here. It is my sworn duty to provide you with a breakdown of what I saw, tasted, sipped, and experienced during those fun filled two days. So sit back, relax, and enjoy my overview of my weekend in more detail. It is so extensive that I decided to put it into categories of Entertainment, Food & Wine, and Merchandise. If you find that my writing style fluctuates, I apologize. It is just that getting everything down on paper is not an easy task! 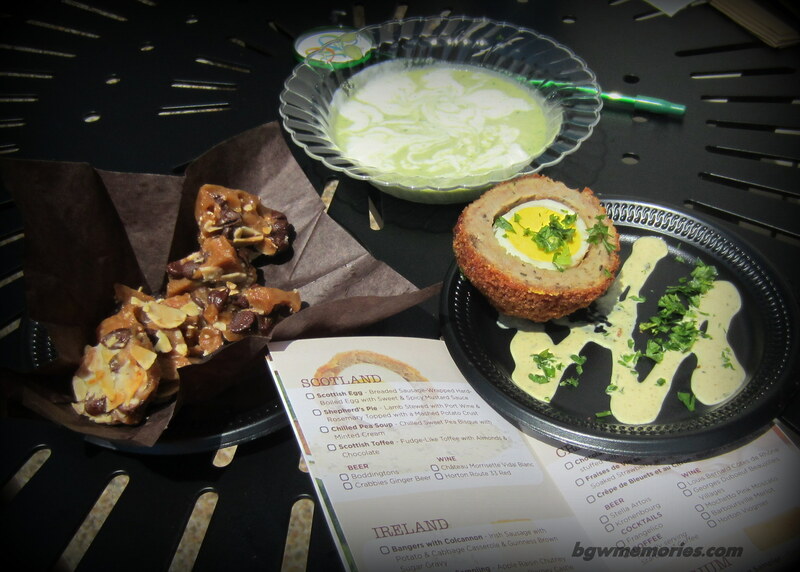 Well here goes… prepare yourself for a Busch Garden’s fan-foodie extravaganza of information! Are you all a twitter yet? You should be! 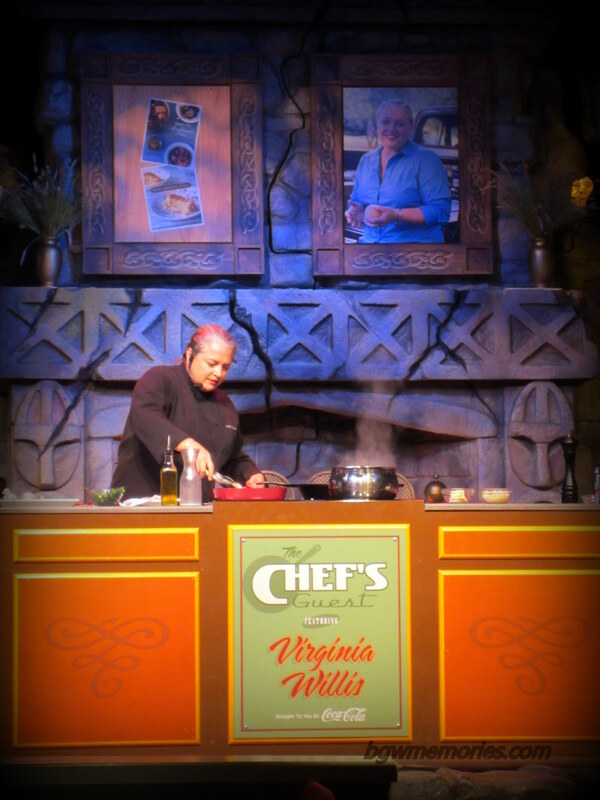 ~an interactive dinner show with Virginia Willis, a highly acclaimed chef and writer. I wasn’t sure what to expect from this show as I have never attended a cooking demonstration-dinner hybrid before. I was pleasantly surprised. Virginia Willis was charming, funny, and the meal she prepared for us was divine. Her story about her grandmother was so heartwarming and thanks to Virginia, I will never look at Grits the same way again. She made me a “true grit” believer! I am already planning my own version of her recipe in the near future. Overall Experience: Well worth the cost. The food was fabulous and did I mention the grits? They were absolute perfection of a Southern classic dish! I chose Elios Mediterranean White Wine to pair with my Pork Loin and found it was a very smooth and went great with my meal. I highly recommend it. 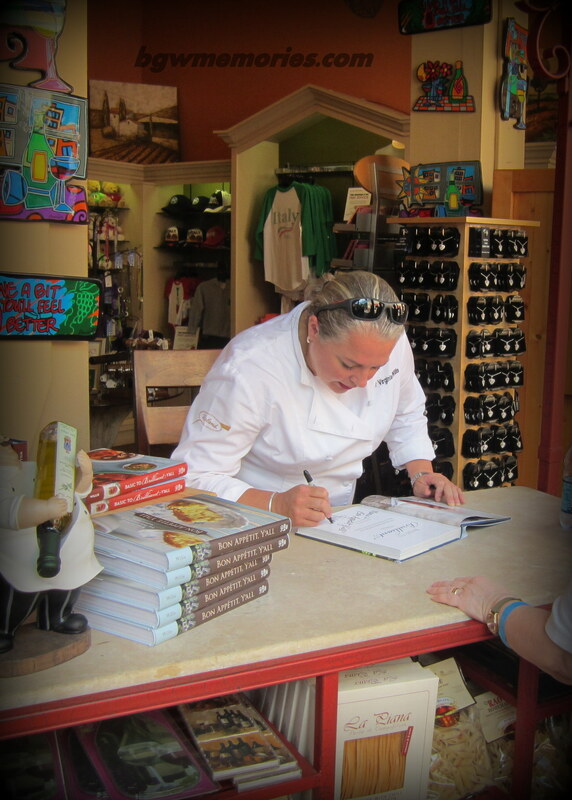 What is included: Learning how your meal is prepared along with recipe cards to take home. Menu includes Gold-Peak Sweet Tea Brined Pork, Tangle of Bitter Greens, Grits with Corn and Vidalia Onions, assorted desserts including Coca-Cola Cake. One Alcoholic Beverage is provided with proper ID, water, soda, or coffee. Dates available: These may sell out fast! There are only two more days left to book the dinner- June 15th and 16th so book it now y’all! ** If you do not wish to purchase a ticket, you may still be able to see Chef Willis on stage for no additional fee at San Marco Theater June 15th and 16th (dinner and beverage are not included). Chef Willis prepares our meal. 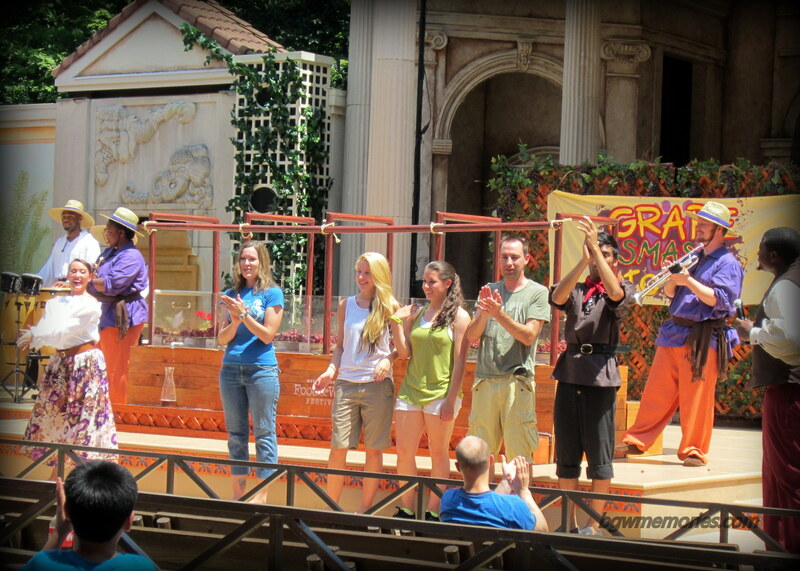 ~ an interactive show where four guests are selected to actually stomp grapes on stage at the San Marco Theater. I was anxious to see the show and made sure that me and the group I was with got to the theater early to find a seat. However, I didn’t sit down long as I was immediately selected to be a participant! Talk about exciting! The performers gathered me and three other individuals in a huddle and gave us directions on what to do. 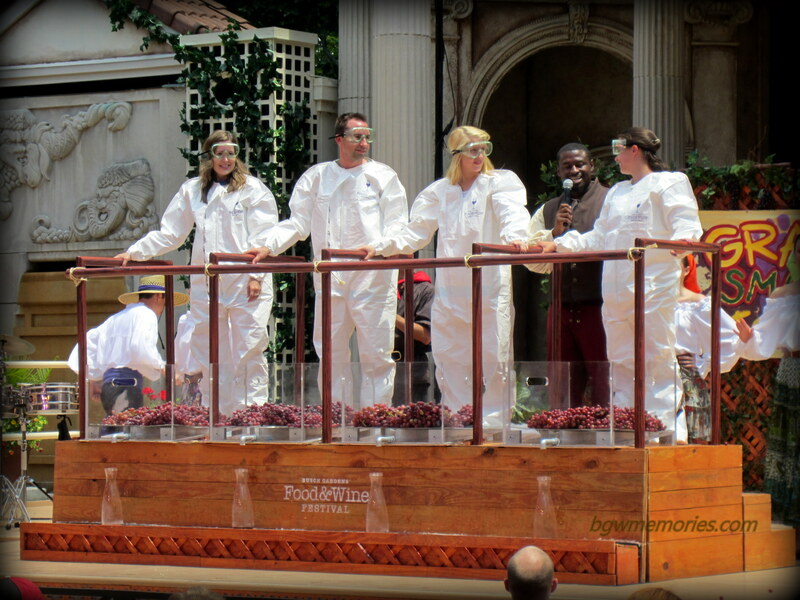 We were to put on these white suits and protective goggles, go on stage, and stomp the living daylights out of some grapes in a friendly competition of sorts. I did my best, but alas… I will not harbor any “sour grapes” towards the victor. Overall Experience: It was hilarious! I had a complete blast being in the show and came back later to see the show from another perspective. It is just as funny watching people hop around on grapes. The music and humor make the show very entertaining. A memory I shall forever cherish! Thanks Busch Gardens for making my day! Thanks to www.bgwfans.com for filming and sharing their link with me. The end! Winner is Bryan from Pittsburgh! Congrats Bryan! 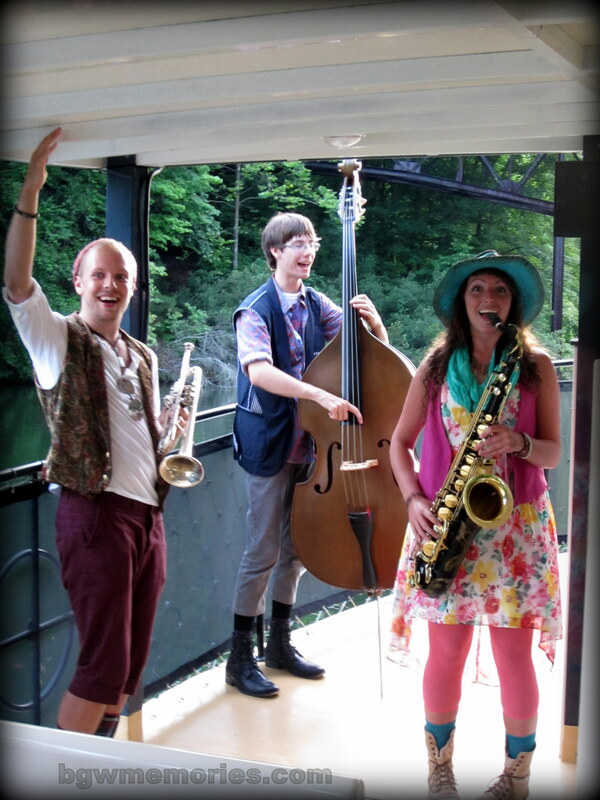 ~ A live band performs on a Rhine River cruise while you enjoy a glass of wine and treats. 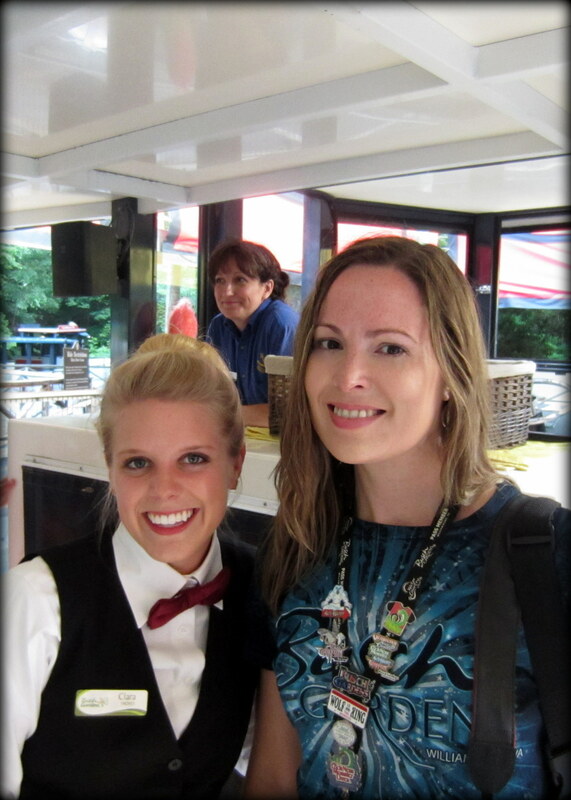 As soon as I heard that Busch Gardens was offering a separate cruise on the Rhine River to enjoy music, wine, and food, I never hesitated. I bought the tickets as soon as they went on sale. This was something I had hoped the park would do for years and I was not disappointed. My cruise was perfect. The evening had cooled off and dusk allowed the landscape to be lined in soft shadows. The quiet motor of the boat was a perfect tone to set a relaxing zen state of our group. Our hosts and hostesses made sure we were clear the bridge and a tray of food and the cutest bottle of wine were both handed to me. 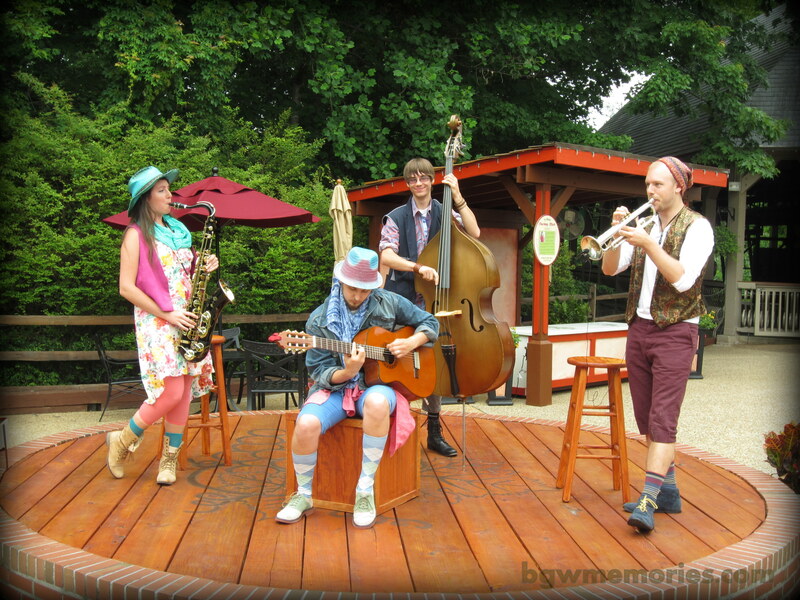 The band began to play the perfect blend of nautical, whimsical music. I was so lost in the music, wine, and chocolate that it really surprised me to see the boats take us all around the right bend of the Rhine River; an area that was once a part of the old cruises in the early years of the park’s operation. Overall Experience: I adored every aspect of this cruise from beginning to end. Perfect. Book the tour now as I think it is an absolute steal! This is a perfect date night, girl’s night out, or just a fun way to spend a weekend evening. Cost: $16.00 (Pass Member Discounts will apply) Seriously- $16.00 – book it before it is sold out! Otherwise, Que Syrah Syrah. ~ba dum bum! 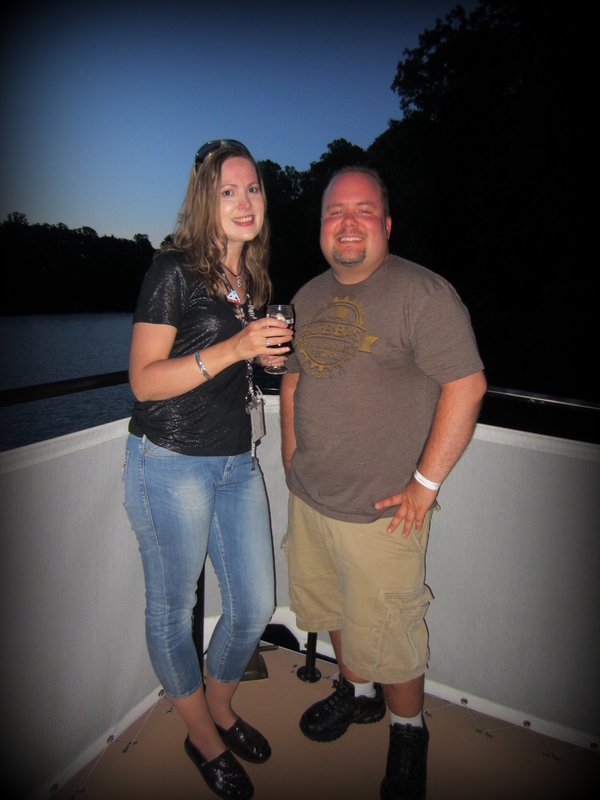 My friend Luke and I enjoy our cruise on the Rhine with wine! The wonderful Wine of the Rhine River cruise band! 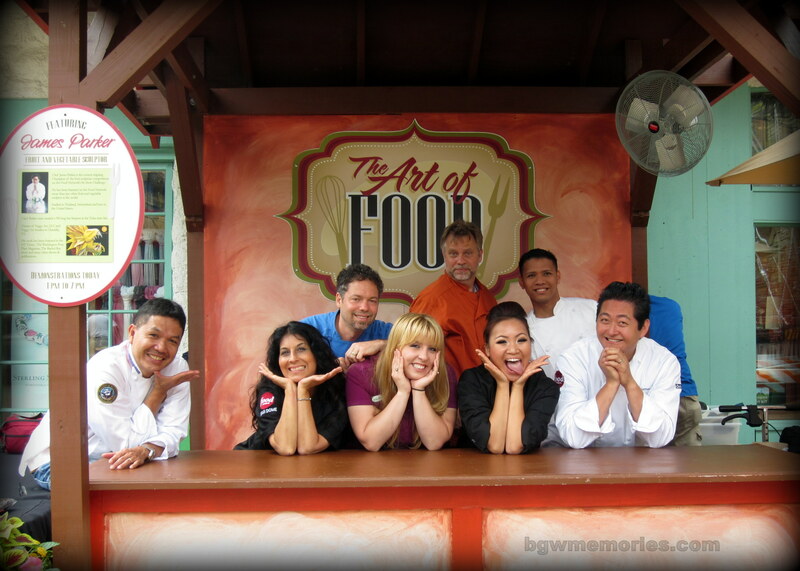 ~Busch Gardens has rounded up 15 various food art experts and will having food demonstrations of their work in three locations in the park during the Festival. I happened to run into Burton Farnsworth, an extremely talented artist who can make illustrations out of fondue that you would not believe! Being an artist and trained in animation, I was entranced by his work. Please make sure to look around at the Festival for these booths and see what magic is being made at each station. Obviously no one told Burton not to play with his food! Locations: Ireland, France, & Italy. Burton was so much fun to meet! What talent! The art of food artists of 2013. Fabulous! 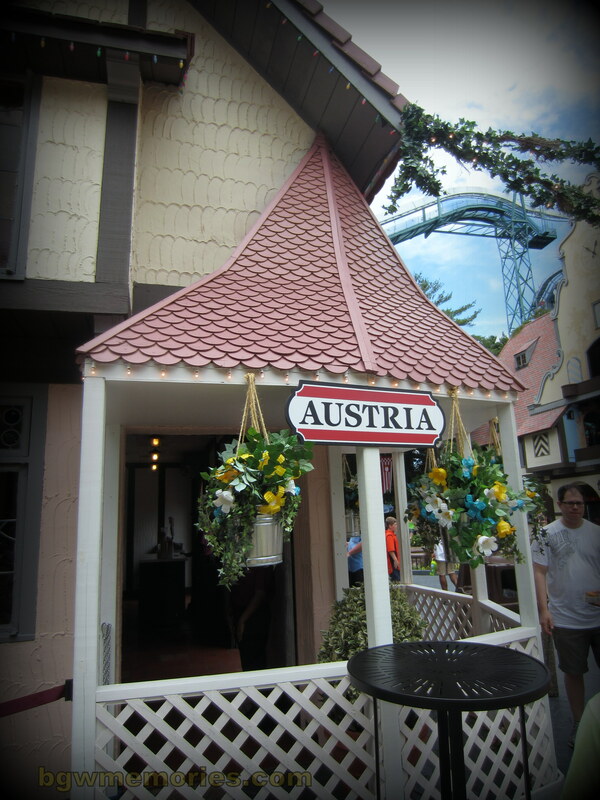 Kiosks are set up around the park that house samples of various famous dishes from various European Countries. 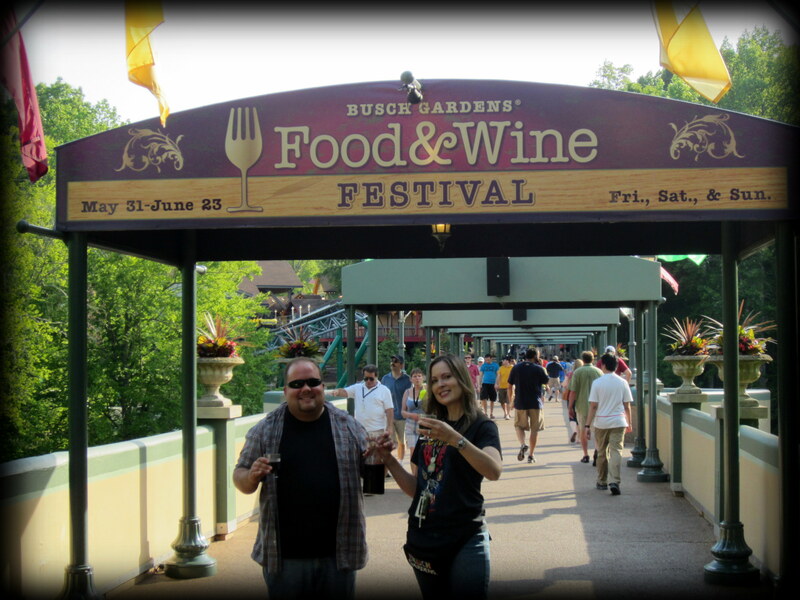 After my second day at the Food & Wine festival, I would recommend purchasing a pre-paid wristband at the Food & Wine Welcome Center when you enter the park, grab a “passport” food & wine brochure and a pen, and set off on a major culinary adventure! Location: Where Pigs in a Kilt normally operates. It is tucked under an overhang near the stables. This is the location of the famous Scottish Egg, so you may want to have a little “Egg Hunt” of your own! 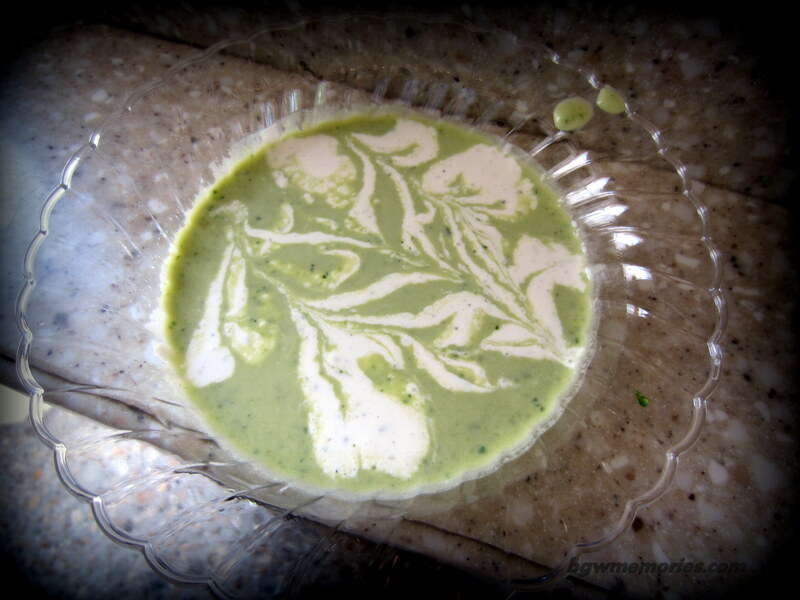 Chilled Pea Soup: The day I went to the park was extremely hot! The first stop was Scotland and I chose the chilled soup. This is not for everyone, but folks who enjoy a little adventure in their meal will love it! Presentation: a beautiful swirl of green and cream. Taste: Minty, Sweet Pea Bliss! Wine: I chose the Chateau Morrisette Vidal Blanc as I thought it would balance my sweet pea soup. It did. A lovely Virginia Wine on a hot Virginia day. Location of Kiosk: Tucked away in the old Bistro 205, France is a bit hard to locate. However, I highly recommend stopping there. I made it my first destination of the day as I thought it was an appropriate way to start out the Food & Wine Festival. C’est Si Bon! Magnifique! Having waiters bring you the food to your table was a nice touch. 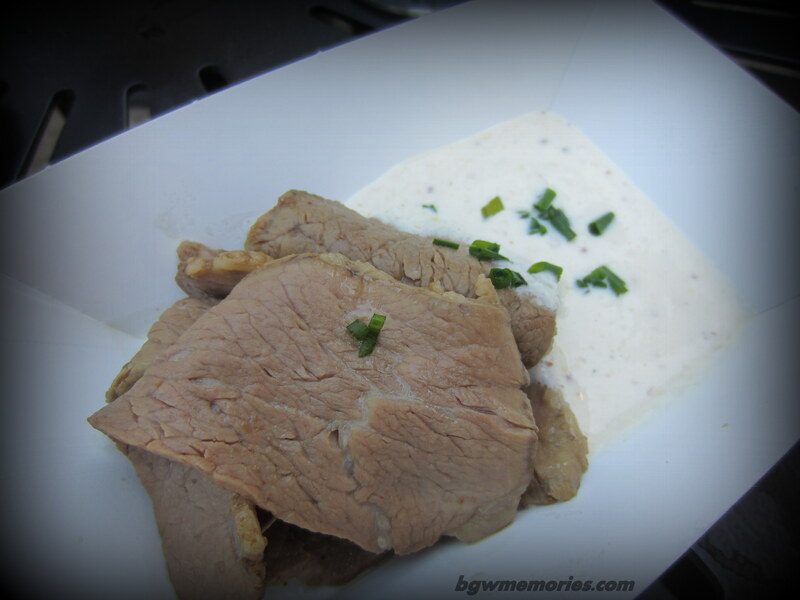 Vichyssoise: I had this dish on my first day at the park. What can I say; I am a fan of chilled soup on a hot day! Basically the soup consists of sweet onion, leek & potato puree with truffle essence. Presentation: Simple as it should be. Taste: A balance of bitter and sweet. The name may be hard to pronounce, but what a wonderful treat. This dish is for folks who wish to extend their pallets and try something a little different. Moules Provencales Avec Rouille: Balancing my meal, I decided to try the steamed Mussels in Tomato Fennel Broth & Lemon Saffron Mayonnaise. This was the first time I have ever had seafood at the park and shellfish of all things! 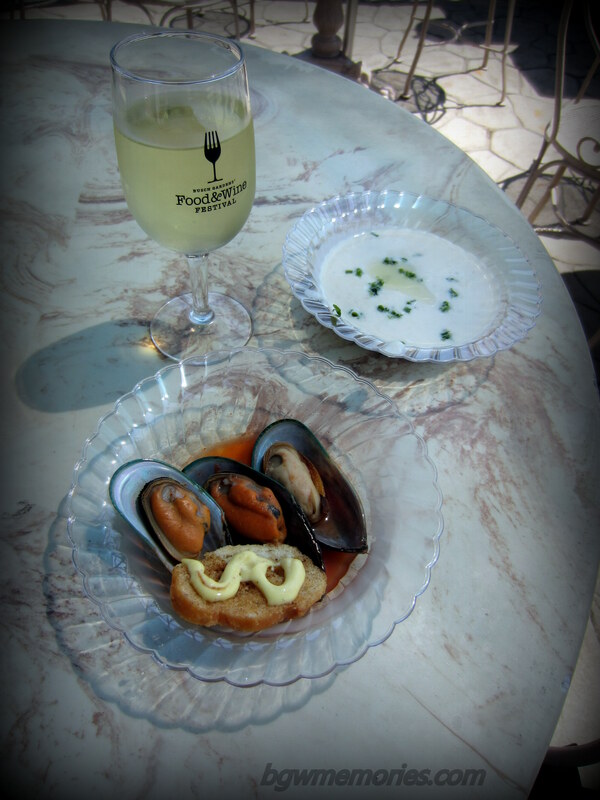 Presentation: Three Mussels in a light red broth. Taste: I enjoyed it. I just wish there were more than three mussels. I love seafood! I see food and I eat it. Ba dum bum. Thanks, I’ll be here all week! Wine: Horton Viognier: Horton is Virginia Winery and many people may not know that the Viognier was pronounced Virginia’s State grape in 2011! I love Viognier and this sample had that refreshing splash of flavor I needed with my seafood dish. Location of Kiosk: Trapper’s Smokehouse outside grille. Look for the very large Canadian apple and onion themed sign. It screams Oh Canada! Pumpkin Carmel Mousse: I actually tried this at the “Chef’s Guest” show but nevertheless shall review it here. Presentation: a generous portion of crème’ brulee style custard in a clear cup. Taste: Creamy, smooth, and oh so good. Pumpkin and Carmel- how can you go wrong? Location of Kiosk: This may the hardest kiosk to spot. 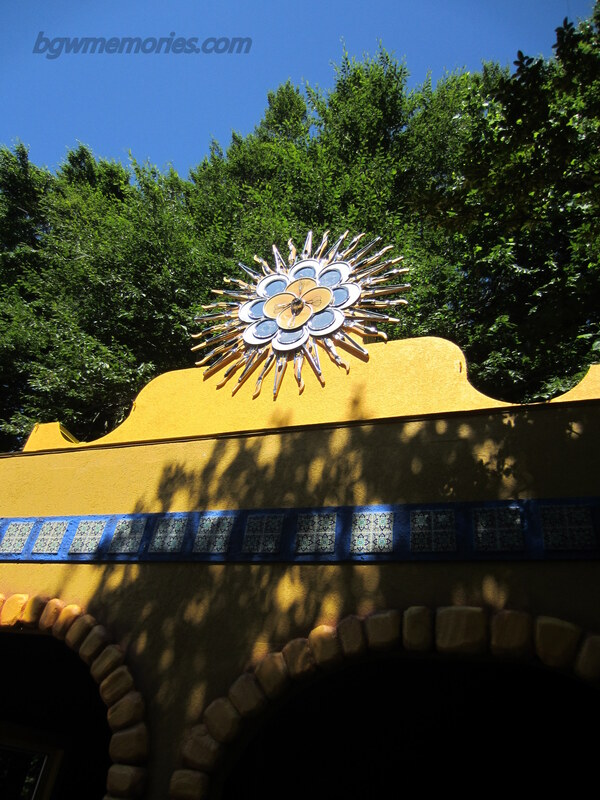 It is inside the Funnel Cake building in Rhinefeld Germany. The line begins to the side closest to the carousel. Hopefully, it is not too tucked away. I would hate for people to miss the dishes of Austria. Tafelspitz mit Apfelkren: Being that I traveled to Germany and Austria; I was really being critical of this dish. It is the national dish of Austria, so I was nervous about how they could possibly get the flavors authentic enough for my liking. Presentation: In a little tray are several slices of beef that has been simmered in a broth and sliced thin. Next to it is a horseradish and apple sauce that you dip the beef in. Taste: LOVE, LOVE, LOVE! I will say that before you run out and buy it… you have to like horseradish. If you don’t, forget it. It is not for you. I am still impressed how the chef’s got the horseradish to balance with the apple flavor, but they nailed it. Bravo. 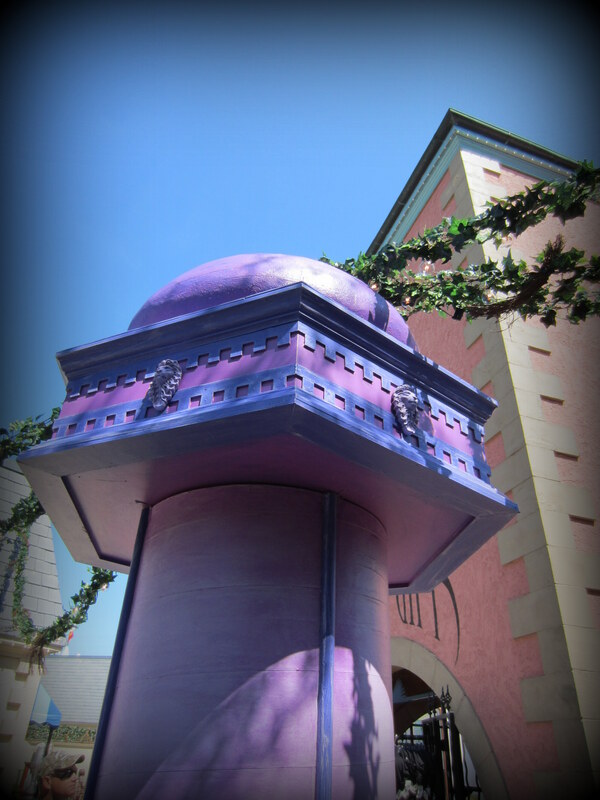 Location of Kiosk: Centrally located near the Festhaus, Darkastle , and Mach Tower. 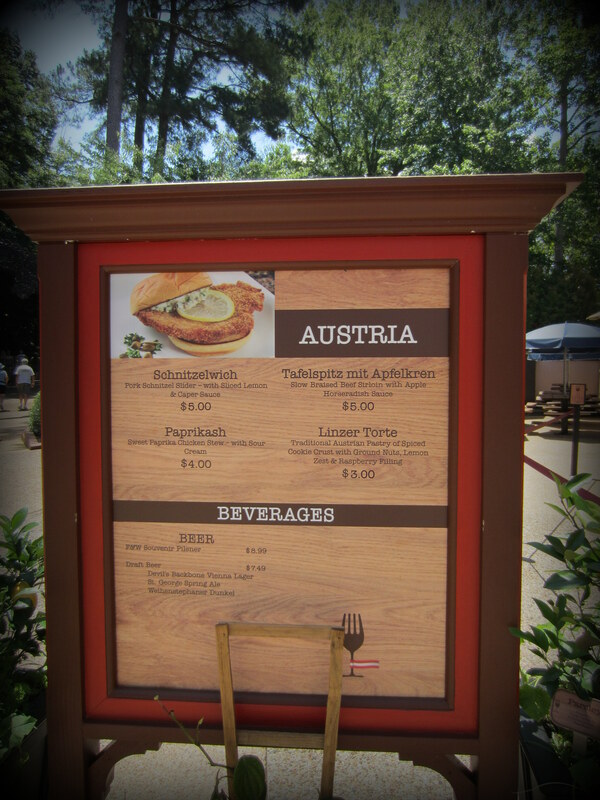 The food and beer stand in Germany is impressive and worthy of the center stage. Da isst es sich gut! 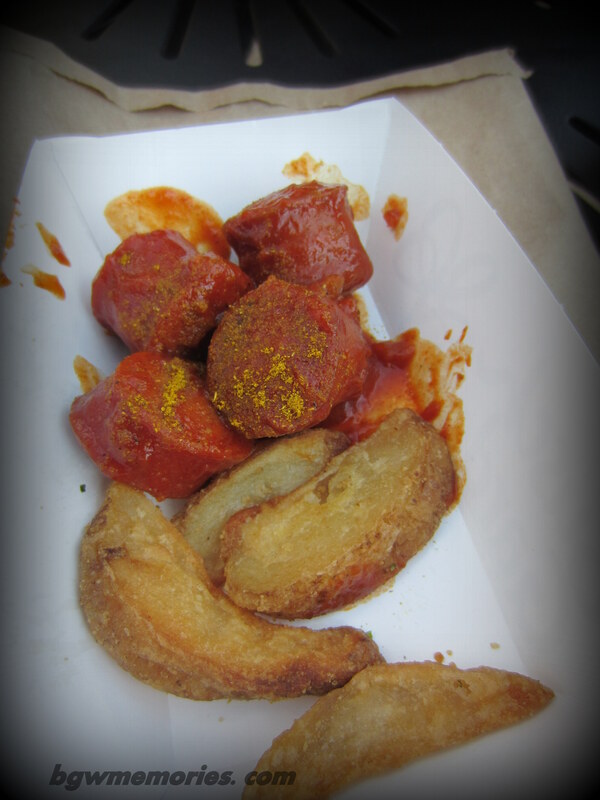 Currywurst: This was the dish I was craving since the announcement. I loved this dish when I was in Germany and I often ordered this is little restaurants and street carts in Berlin and Leipzig. Presentation: a little paper tray with several cuts of Knockwurst with spicy curry tomato ketchup and a side of roasted potatoes. Taste: It took me back to Germany. I felt like I had just handed my money to a vendor in Berlin, not Williamsburg. I will be enjoying this dish again and again for the remainder of the festival. Es schmeckt gut! Sorry, this smelled so good that I started eating and forgot to take the picture. This is already munched on! I am unable to drink beer; but was lucky enough to be with folks who were enjoying both beer flights. Option 1: German Beer Flight or Option 2: Virginia Beer Flight. I am providing photos of the samples as I felt it was a great deal! Even though I couldn’t drink them, I thought they smelled wonderful! The presentation of the samples was fabulous and even included a break down of the beers and their flavor profiles. Location of Kiosk: Behind San Marco Theater. This Kiosk may be missed if you are walking from Italy to Germany, but could never be said if you were walking the other direction. It has a gorgeous sign made out of wine corks in the shape of huge grapes. I love that detail. Molto Bene! Bellissimo! Caprese Salad: One of the best deals in the park. Fresh Mozzarella, grape tomatoes, and a salad mix with Italian Vinaigrette. Presentation: Salad in a cup. Taste: Cold, refreshing, tangy salad with lovely chunks of mozzarella. Antipasto Platter: Sliced meats, olives, mozzarella, and roaster red peppers. I wasn’t super hungry and this dish offered a nice portion for those who would like a nice snack with wine. Taste: meats, olives, and cheese. Again, how can you go wrong with that? Panna Cotta: Vanilla Cream Pudding with strawberries. Presentation: Artistically presented on a platter with a sliced strawberry to the side. Taste: Delicious. I wish this was served all year long. Wine: I love Chianti and so I chose the Donna Laura Chianti. It was mellow with a few peppery notes. It went well with my Antipasto Platter. Delizioso! Location of Kiosk: In Italy on the right hand side between Da Vinci’s garden and San Marco Theater. It is a brightly colored kiosk that cannot be missed. If you look closely at the silver sun on the top and side, you may be surprised to find out that it is actually made from cooking utensils! 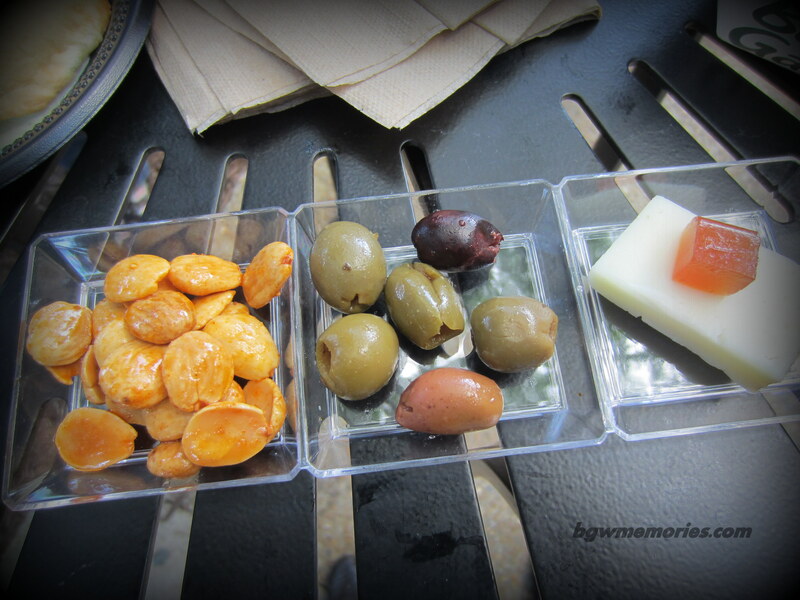 Tapas: Roasted Marcona Almonds, marinated olives, and manchego cheese with Membrillo (quince paste). Presentation: Most impressive presentation of food in the park I have seen thus far. 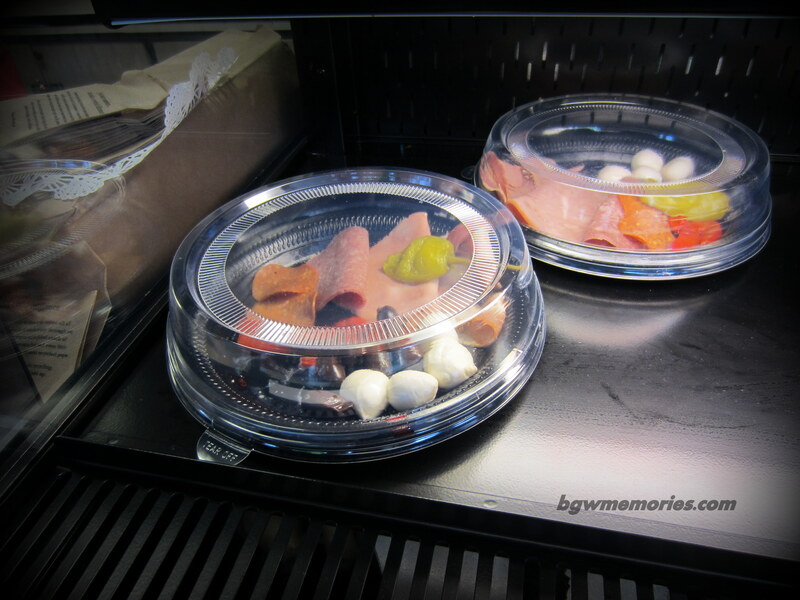 A clear plastic three divided tray is used to separate the ingredients. Taste: I could eat these items all day long… on weekends, at night, in a box, with a fox, on a train, in the rain. I was surprised at how something so simple in concept, could be so enjoyable at a theme park. 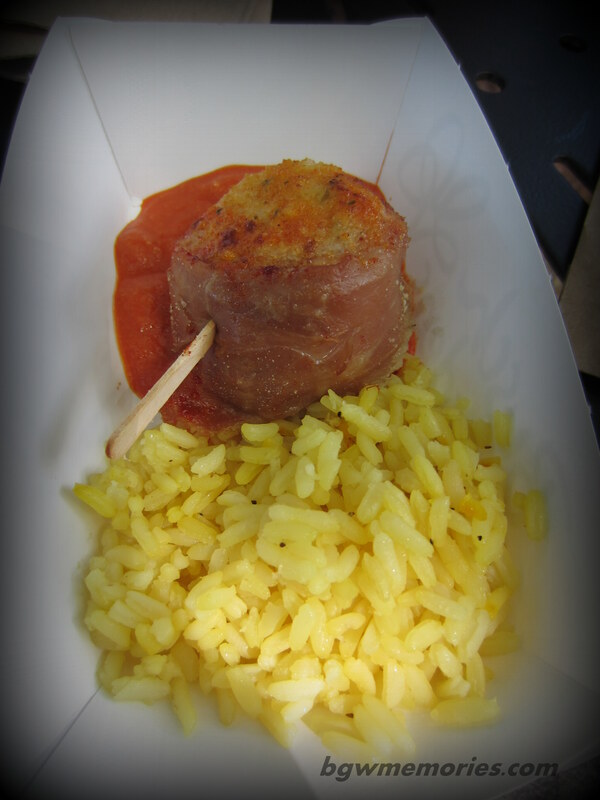 Venera con Jamon: Scallop Wrapped in Cured Ham with Saffron Rice and Romesco Sauce. Presentation: A jumbo scallop cooked with a strip of bacon skewered together and a side of rice. Taste: The Scallop was amazing. It was wrapped in Bacon. Case closed. I wish the rice had more saffron but since it is the most expensive spice per pound, I shouldn’t be too picky! Still, it prepared well and I will never, ever turn down a scallop. Or Bacon. Mmmmm bacon. Pancho Sangria: I was told by two of my friends that this was astounding. Therefore, I shall try it on my next trip. This Scallop is calling my name! Location of Kiosk: Next to Escape from Pompeii. 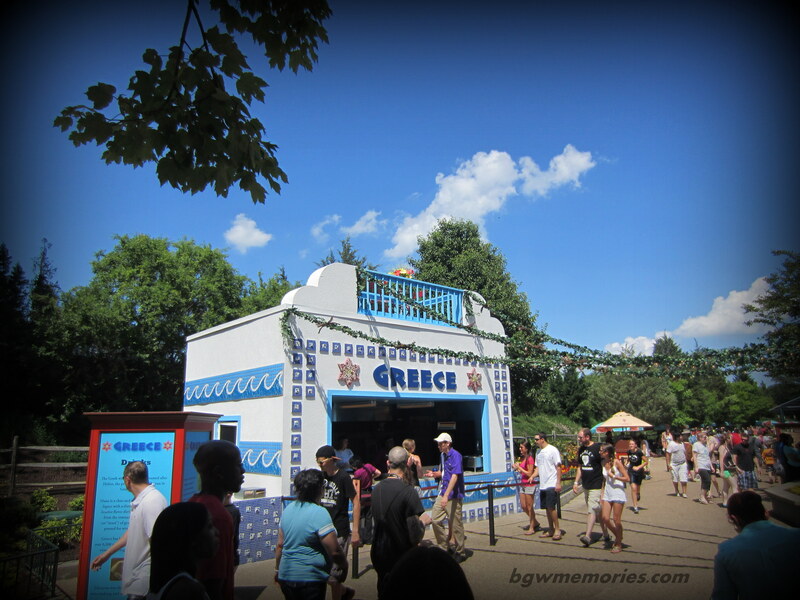 White with a blue tile mosaic pattern; there is no confusion that the kiosk represents Greece. However, don’t forget to look up! There is a super cute little red table on top with two bistro chairs. Simply adorable. I wonder if you can ask for reservations. Cute little detail on top! Halloumi: MY FAVORITE DISH AWARD GOES TO THE MIGHTY HALLOUMI! Griddled Greek Cheese with Clover Honey and Crushed Pistachious. Presentation: Exactly that. 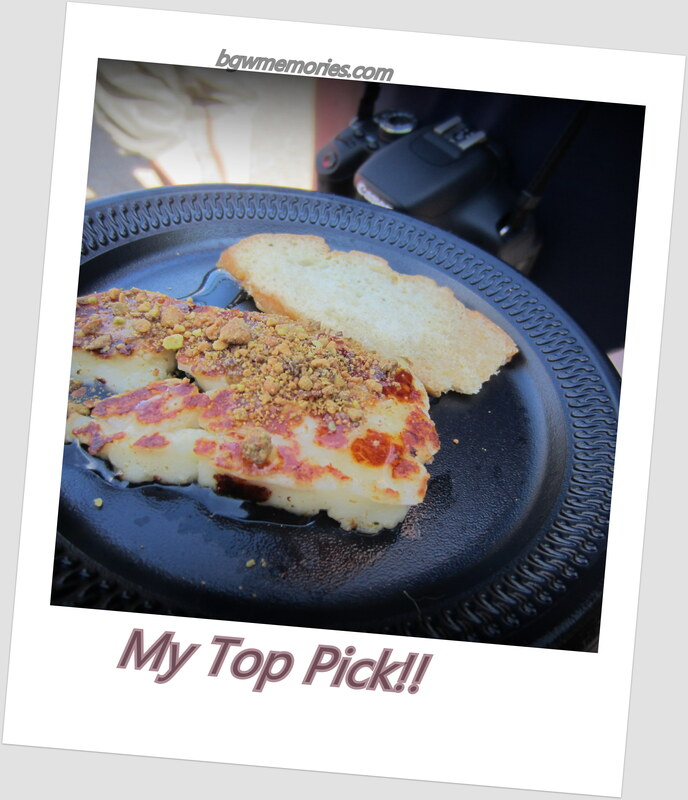 Taste: Heaven in Cheese form with honey and pistachios on top! More please? 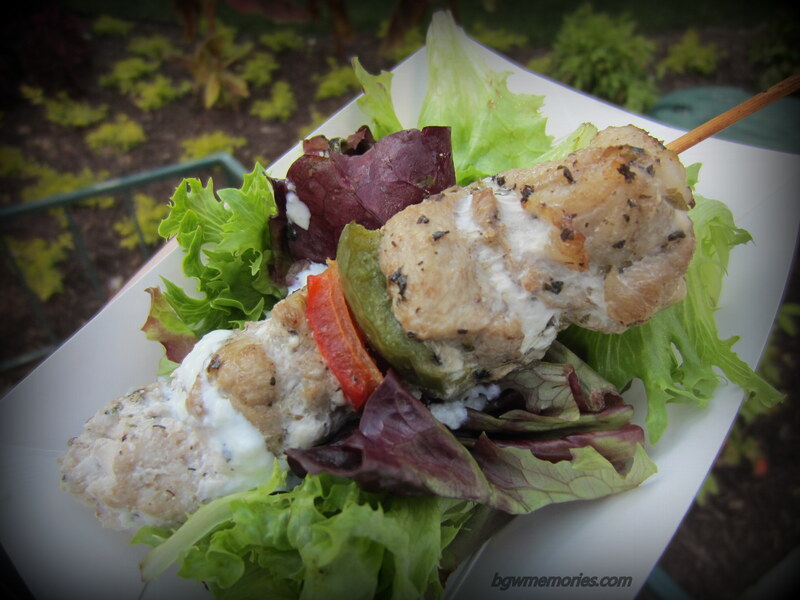 Souvlaki Tzaziki Presentation: a marinated roasted pork & sweet pepper skewer with cucumber dill & yogurt sauce over a bed of fresh greens. Taste: Awesomeness on a stick. Salata: Greek Salad with Lemon Oregano Vinaigrette and a crispy pita chip. Taste: Greek Salad is hard to make unique when you can order it so often at restaurants. However, the Lemon Oregano dressing makes this salad a little different and I really enjoyed it. Wine: Elios Mediterranean Red Blend: Smooth and somewhat dry. I chose this wine to go with my pork skewer and salty Greek salad. It was a good, but I could also see the Elios white wine being a better choice with the pork. Location: As soon as you enter Ireland from Scotland to your left. Previously a food cart, this area was touched up to have more of a Celtic Flair and offers Irish food like Bangers and Colcannon, Irish Cheese and of course, Guinness. Location: Ireland; across from the Abbey Stone Theater. 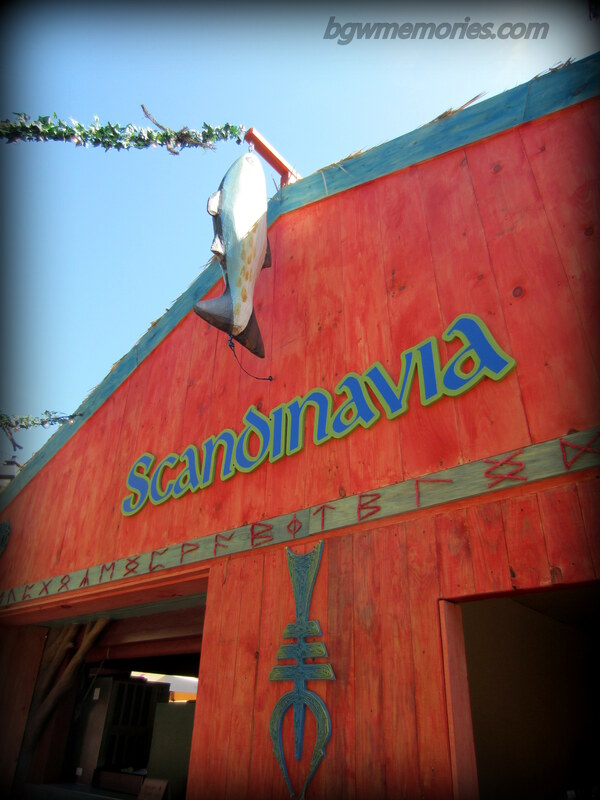 Rustic décor with a mighty big fish hanging off the building signifies you are at the Scandinavian station. Cured salmon, Swedish meatballs (that I heard were fantastic), and a waffle cone cookie are your choices here along with wine and a frozen cocktail. Location: France near the Le Belle Gift Shop. A beautiful new addition to the park; this stand is under a wooden trellis with hanging wisteria. Here you can buy a crepe, coffee, or a glass of wine. Having French waiters greet you and ask you about your day while enjoying your food selection: Priceless! Location: In France near Griffon Gifts. It was formally a drink kiosk and features a lovely little sampler platter of Belgian chocolate, toasted hazelnuts, and Edam Cheese. (Much like the Spain Tapas plate). 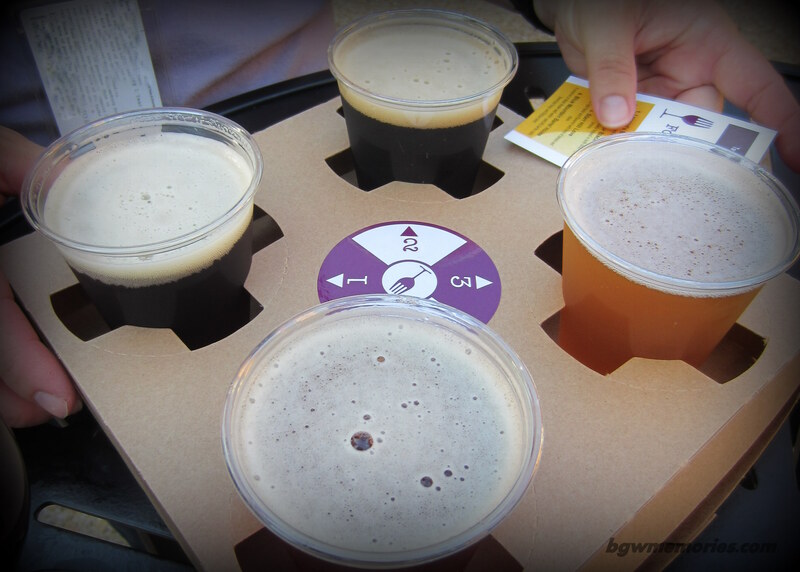 The booth also has a Belgian “Beer Flight” of four beers. Look for this tower. If you find it, your next to the Belgium kiosk. 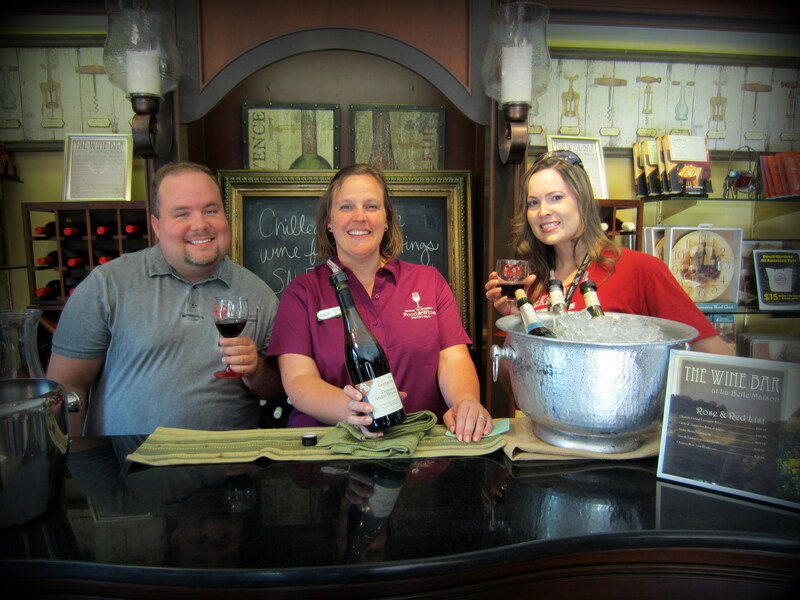 Different from the wines featured at the kiosks, the Wine Tasting is offered at three gift shop locations: Bella Casa, Le Belle, and German Gifts. 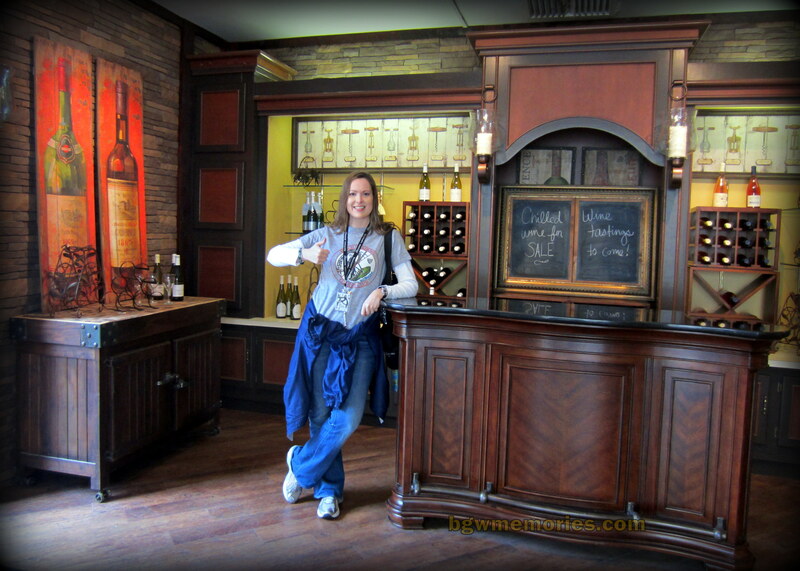 These locations also feature wine related merchandise, apparel, and even bottles of wine. 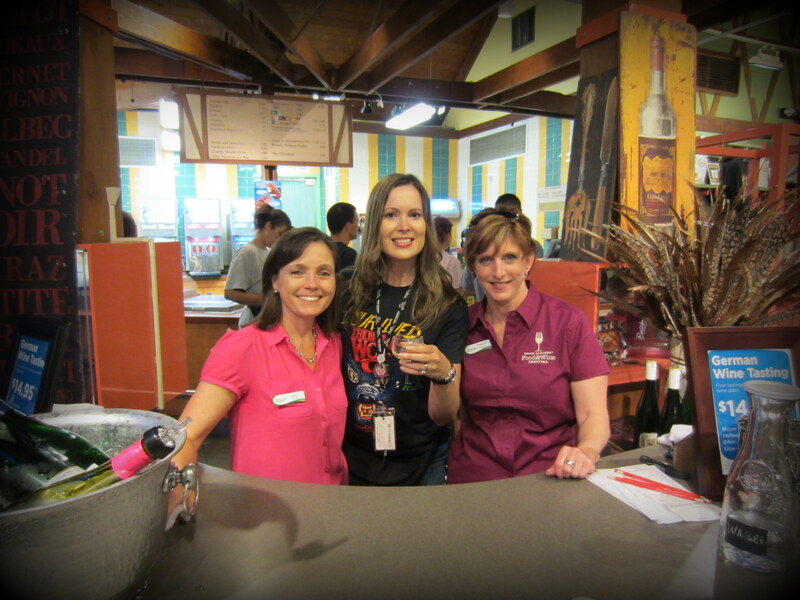 Each location offers the guest four samples of wine and a souvenir Food & Wine Festival Glass for $14.95. Once the glass has been purchased, one can take it to the two other locations and partake in the tasting for only $6.95 (Season pass member discounts apply). DEAL! 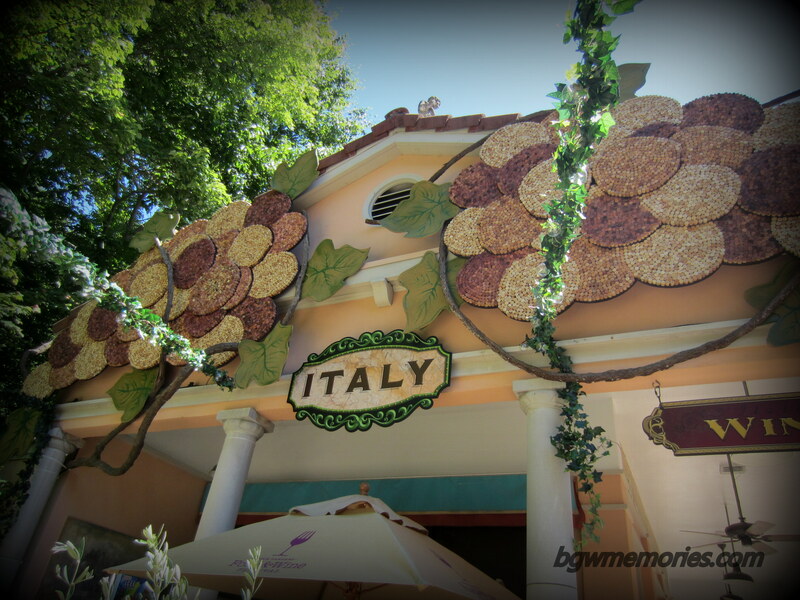 Located near San Marco Theater and adjacent to the Artisans of Italy Capodimonte shop; Bella Casa features an Italian Wine Tasting or an Italian/ Virginia Wine Comparison. 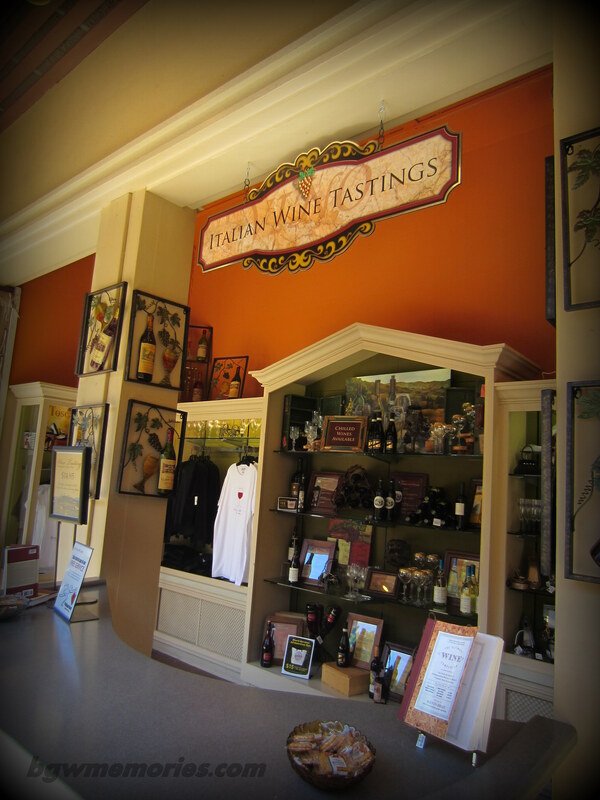 My favorite wine of the festival so far belongs to a local vineyard and featured a wine at the Bella Casa Gift Shop. 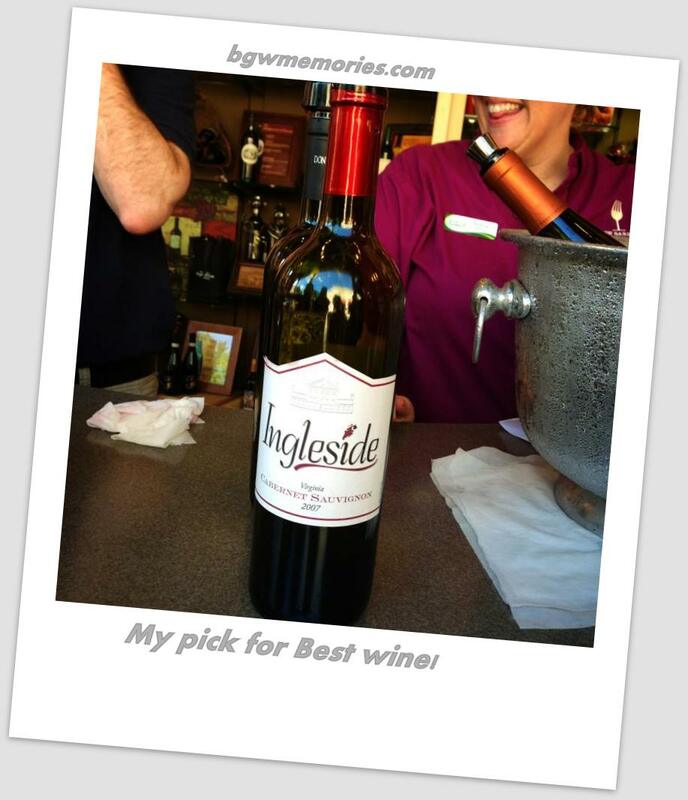 So Congratulations to Ingleside 2007 Cabernet! The Bella Casa Wine Tasting area. It is always fun to drink wine with friends both old and new! 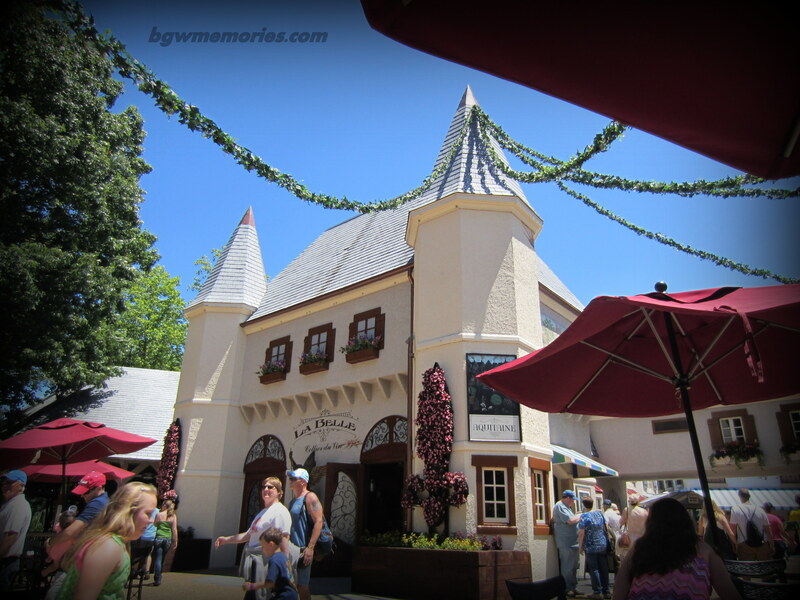 Located in the Aquitaine section of France near Le Aeronaut Skyride, Le Belle offers a selection of French Wine or a Virginia/ French comparison. The French rosé was my favorite, but honestly; they were all very nice. 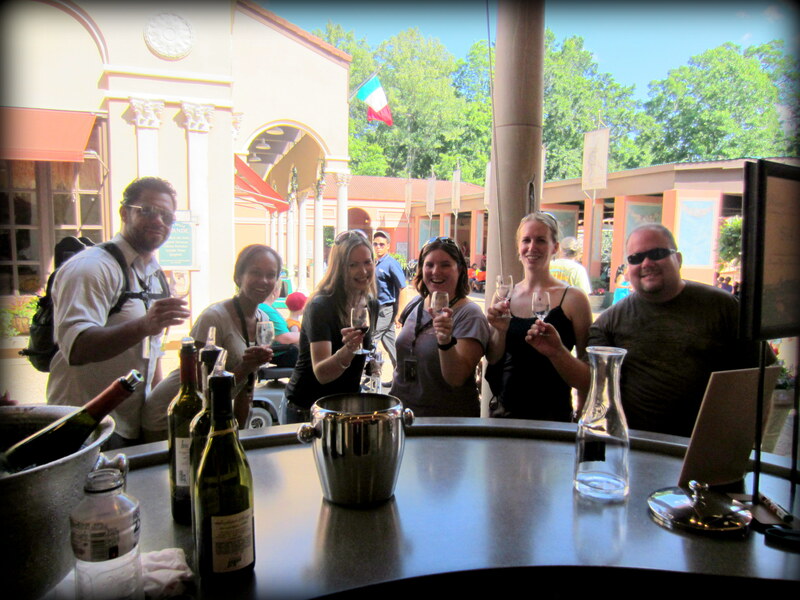 Where to find the French Wine Tastings! Located in the Rhinefeld section of Germany, German Gifts hosts an array of German Rieslings as part of their tasting set. I am not one to drink sweet wines such as Rieslings, but after tasting their selections; I was impressed. 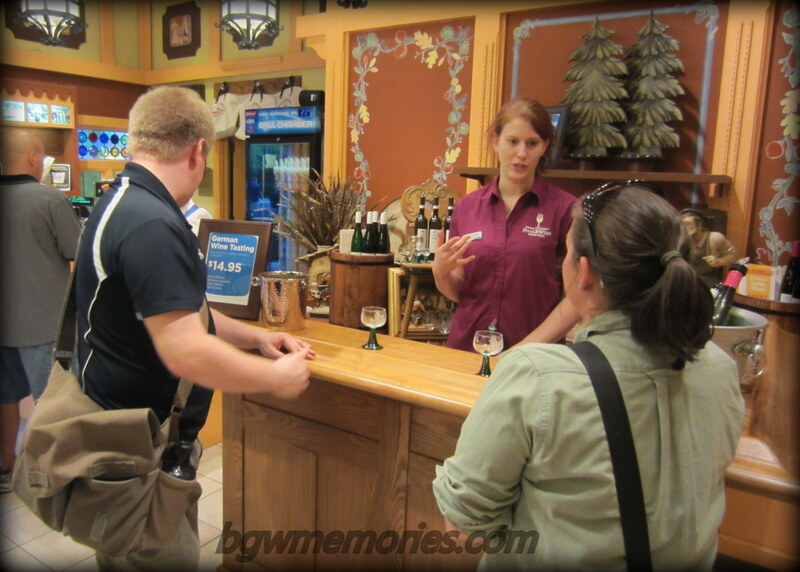 Each of the above gift shop locations offers full bottles for purchase either to enjoy in the park or to take home. Just be aware that once the bottle is opened, it cannot leave the park! So if you plan on drinking a bottle with friends, best to start early and finish it in time before you leave. Tee shirts and tote bags with the Food & Wine Logo are also being sold in the park. 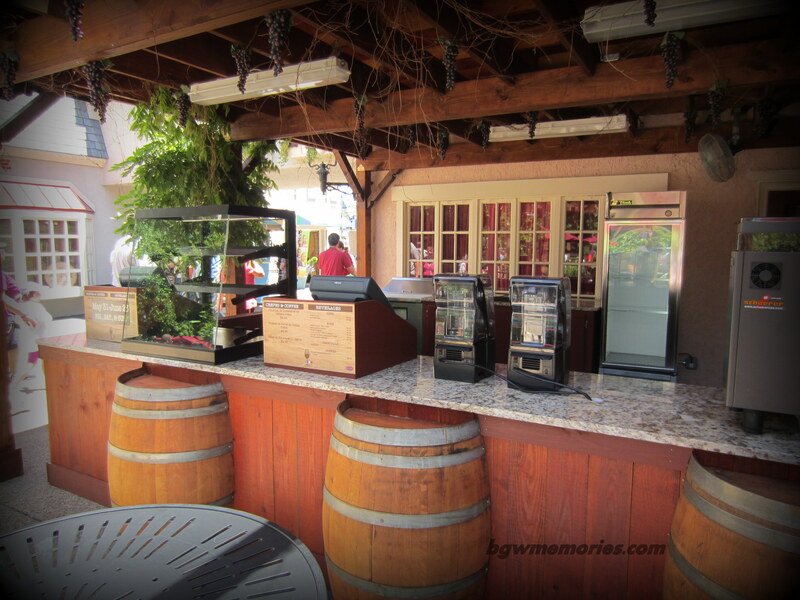 Food & Wine Cashless Wristbands are also sold in several stores in case you miss the Welcome Center entering the park. I cannot encompass the true experience of the Food & Wine Festival into words. It is just that expansive. 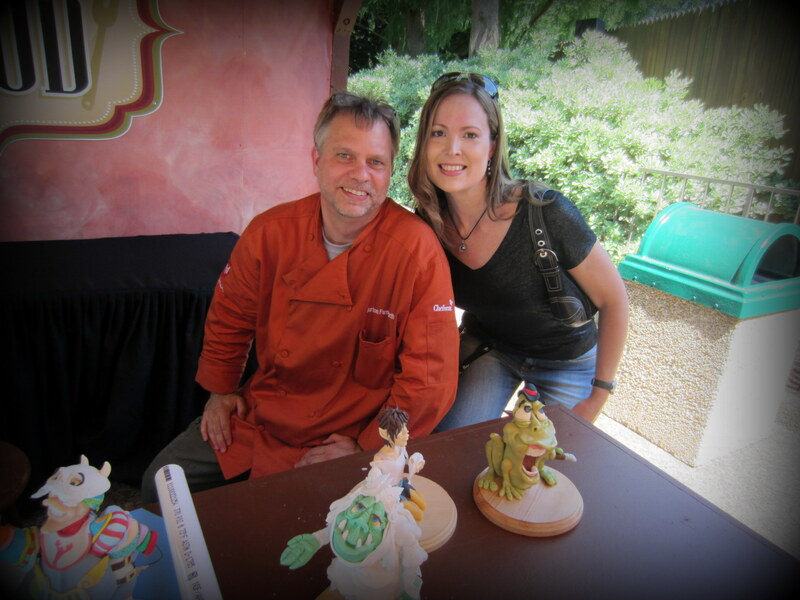 Speaking with Justin Watson, the resident chef of Busch Gardens, I was amazed at how much planning and preparation went into each dish and how even something as having fresh parsley for such a large crowd could pose such a challenge. He seemed quite anxious to hear feedback on the recipes created by the talented culinary team at Busch Gardens Williamsburg. He needn’t worry. Everything was exceptional! “Une des meilleures tables, vaut le voyage” (Exceptional cuisine, worth a special journey). Three Stars! 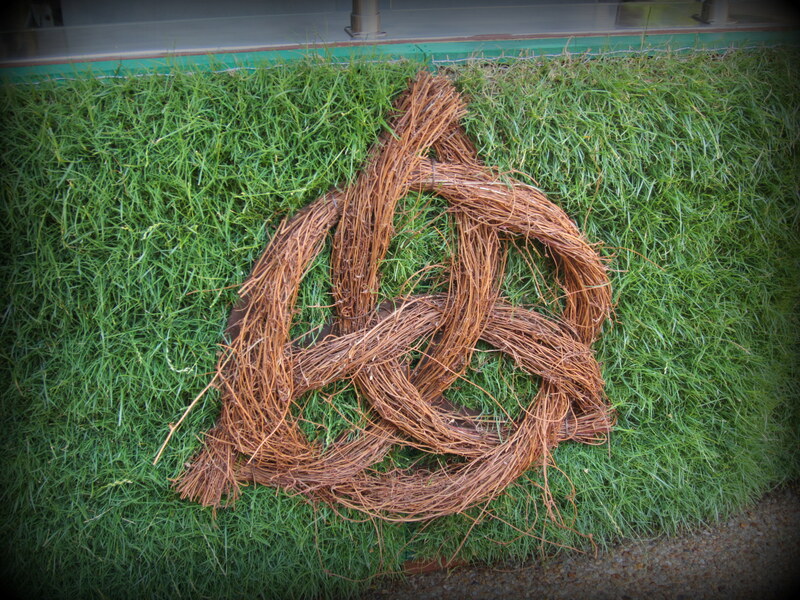 Good Job Busch Gardens! Perfecto! 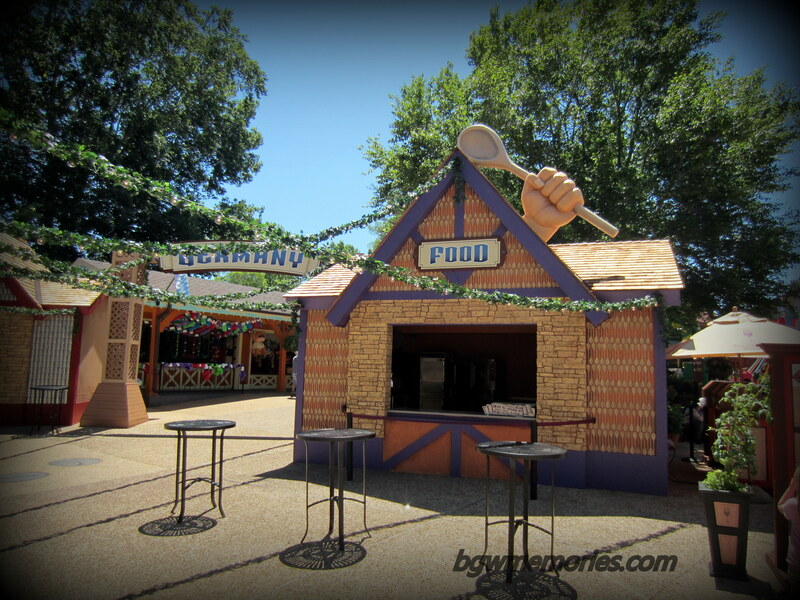 So hop on out to Busch Gardens and discover what your favorite dish is! Just remember to stop and smell the rosé along the way. This is an event to savor!